One of the key building blocks in strengthening your company is putting together a highly productive team. Seasoned executives employ viable strategies to keep their team motivated and prolific. But to build an impenetrable fortification around your company, you need to keep your workforce in excellent health. Australia’s 2017 flu season was the worst the country had experienced in nearly a decade. So, how to protect your office during flu outbreak when we are exposed to increased health risks? Practice these 6 preventive strategies to ward off viruses and reduce the incidence of flu in your office. Our first strategy is far from rocket science. Sometimes it can be as simple as what our mums used to say to us when we were kids. Like the often-repeated remark to wash our hands. Obeying our mothers in this regard is especially important during flu season. But whatever the weather, it seems that we are never aware enough of hazardous effects of skipping hand washing. Take a look at this unambiguous German advertisement on dangers of hand-transmitted diseases. Fresh & Clean is the perfect partner to protect your workplace during flu season. Take necessary precautions with our germ-eliminating hand care program. Antibacterial soap dispensers, hand sanitizers, surface disinfectants, we’ve got it all. Plus we have products available in automatic variation to further decrease contamination chances. For extra safety, use our HandShield Barrier Cream that ensures 4 to 6 hours hand protection. Flu season is notorious for devastating effects on public health and economy. But are we aware of how flu spreads and how to protect ourselves? A study conducted at the University of Arizona shows that viruses spread like wildfire in an office environment. It reveals how germs reach us almost instantly when touching common surfaces, such as doorknobs, desks and coffee pots. “Every time you are touching these surfaces, you are picking up 30 to 50% of the organisms that are on those surfaces,” says the expert Charles Gerba. Then you touch your face, and the viruses can either get into the eyes, nose or mouth, or get back onto your fingers. “The average adult touches their face on average once every three or four minutes,” Gerba said. Did you know that an average computer keyboard harbours 7,500 microbes? And are you familiar with the fact that viruses can survive on office desks for up to 24 hours? So waste no time and fight those nasty germs as swiftly as they attack. Protect your office health with Fresh & Clean’s convenient tailor-made hygiene solutions. Here’s an infographic to have you thinking. 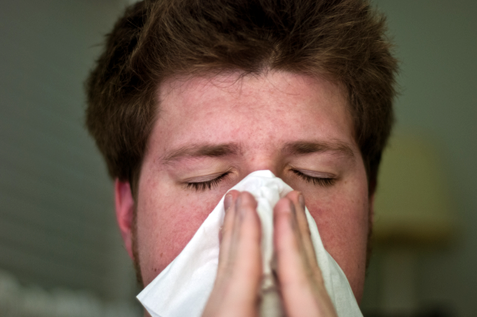 Absence from work due to illness cost an average business $2,230 per employee per year. And it totals staggering $33 billion for the Australian economy. Keeping your workforce healthy will scale down absenteeism. It sounds paradoxical, but one way to do it is to actually encourage your employees to stay home when they are sick. The risk of transmitting the disease to the rest of the staff outweighs the benefits of an infected employee coming to work. Appearing at the office can have a domino effect and decrease workplace productivity. Companies should avoid pressuring employees to be physically present. Instead, they could provide the tools for them to work from home if they feel well enough. And replace face to face meetings with video conferencing and online collaboration tools. There’s a potent line of defense when coughing, sneezing and runny-nosed coworkers keep cropping up and when viruses start lurking in the air. It works on the inside and does wonders for fortifying our immune system. The healthy diet, of course. Arming ourselves with vitamin-packed fruits and vegetables is an unparalleled protection against viruses. Still, there’s a lot more to learn about the health-preserving nutrition science. Organizing balanced diet workshops could encourage healthy eating habits among your colleagues. This can be helpful for your team, since fitting healthy diet into a busy lifestyle is not an easy task. One of the most effective strategies for improving your employees’ well being is to make sure they remain active during the winter season. This can be challenging since in the colder months our body metabolism is changing. We are slowing down and are less prone to maintain the same level of activity we had during the summer season. Lower temperatures may be intimidating, but if they don’t dip below zero, we can venture out perfectly safely. Corporate sporting events are perfect for promoting active lifestyle in your workplace. Experts claim that spending more time outdoors is connected to improved overall health. So, organizing outdoor team activities is a good idea. Think about hiking, cycling or even adventure park tours. You can choose to explore natural assets in warmer regions of your country. Enjoying fresh air and engaging in group activities will benefit your team. Participating in such events is not only equipping your team against viruses, but it is also fun and engaging. Companies are introducing well being strategies evidently for health reasons. But the desire to improve employee engagement, and staff retention is considered the greater catalysts. Essential oils have been used for more than 2,000 years for personal hygiene and medicinal purposes. Nowadays we are becoming more familiar with use of essential oils to regulate mood. However, their influence on other aspects of our health are less known. Using essential oils is actually proven to attenuate influenza virus infection. A 2010 study suggests that “they could be dispersed to eliminate aerosolized virus particles in confined areas”. Essential oil scenting is successfully used to create atmosphere and strengthen business-customer connection. Its antiviral properties, though, makes it a must during flu season for health-conscious businesses. In light of above-given findings, there’s lots of things you can do to protect your office when flu knocks on your door. Encouraging hygienic behaviour of your employees is probably the most promising strategy. You can do it simply by using inspirational posters. It’s an elegant solution to prompt your staff to take preventive measures. Each of the above strategies will take you a step closer to a healthier workplace, increased productivity and profitability for your business. But to be confident of your success in keeping your office clean and healthy, contact your Fresh & Clean local branch today!